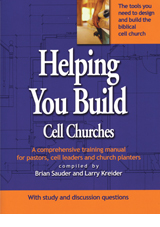 This manual contains the tools you need…it is a biblical blueprint for cell ministry including reaching out, spiritual parenting, mistakes to avoid, leadership training, church government, fivefold ministry in cells, children and youth in cells, church planting, transitioning to a cell-based church, counseling skills for cell leaders, and much more! Join the churches around the world that are adopting the house to house design of the early church and finding it effective in building today. Written by veteran cell-based leaders of DOVE International®, the field-tested training in this manual is the result of twenty years of experience using the New Testament strategy of building the church through cell groups. DOVE International® started with one cell and has grown into a network of cell-based churches in four continents. Learn from DOVE International’s successes and failures in cell-based ministry and church planting. This comprehensive manual covers 51 topics! Includes study and discussion questions with each topic for training cell leaders or personal study. Also has a special church planting tools section in the back of the manual.